Last winter, our leadership team planned, organized and then hosted a mini-conference in August for South MS teachers and community members with the focus on learning and application of that learning connected to diversity, equity, disparity, cultural differences, valuing perspectives, race, inclusion, climate and culture. The mini-conference was a unique mix of experts from near (Des Moines, Waukee) and far (Chicago, Portland), school and community members, professional learning materials and resources along with time for teachers to collaborate together. It was a great event and a common learning experience for our many of our teachers and parents. to provide a space and voice to everyone of our stakeholders in order to assess our current reality and identify or address inequities within our school, district and community. After having some great 1:on:1 conversations with some parents and students 1st semester, I would like to CONNECT with more families by expanding the conversation to small groups of parents and community members. This next step is bring together a group of willing and interested parents and community members to engage in open conversation around diversity, equity, disparity, cultural differences, valuing perspectives, race and inclusion. If you are interested in being a part of this school & community conversation, please reach out to me (email or call) so I can involve you in the learning, collaborating and work (dreaming!). I look forward to hearing your dreams for our students and our school community. mission for this coming year. After reading Jon Gordon’s reasoning behind choosing your ONE word a number of years ago, this is a practice I started doing on my own to better help me drive me toward my WHY, my purpose. By each of us choosing that ONE WORD and then sharing this word with each other, my hope is that this action supports a collective positive vision for our students, staff and building. As the new year begins, I would love to get as many staff, parents and students involved in this by having you select your ONE WORD for the year and submit it here. 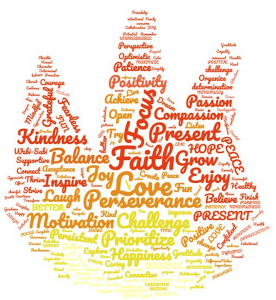 Below is a visual of all the ONE Words chosen over the past 4 years by staff, students and parents. As I thought about which word I was going to choose this year, it was much more of a struggle for me than any previous years. Both at work and at home, the upcoming year brings much change and unknown. Our district continues to grow quickly and the Waukee I knew nine years ago seems to be so much different than the Waukee today. The opportunities for our students are nearly endless, our teachers still continue to do amazing things in the classroom, but the challenges of being able to hone in on the individual needs of each and every student with rapid growth and 100s of new students can be daunting. The need for me, each of us, and our entire building/district to understand and connect with our changing student and community population is vital for us to continue to be THE leading district in the state. I believe in Waukee and know it will take listening and work to be the school we want to be for our students and families. At home, my oldest child will graduate and head off to college next fall followed by my other two children in the not-so-far-away future. The life I know today in my home will look drastically different over the next 1-5 years. I realize my time to share all my parental knowledge and shape them into the young men I want them to be is running short (I do know my limits here as well!). Be present in my conversations with our stakeholders. 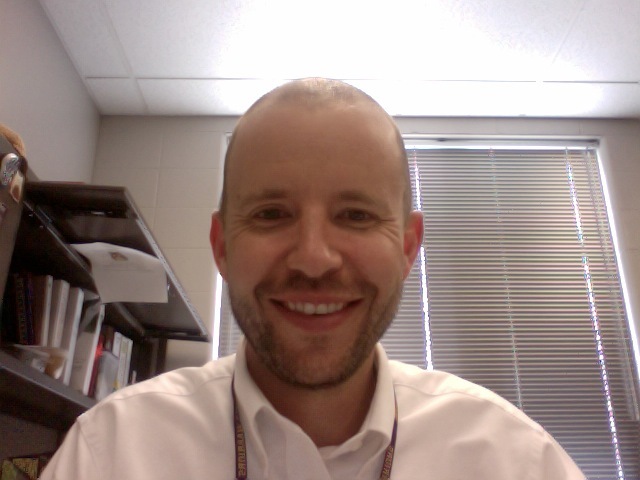 My goal is to engage in a number of student and community conversations (1:on:1; small group, etc.) to deepen my understanding of who we serve and how I/we can do it better. Be present as much as I can when I’m engaged in conversation with teacher teams, walking through classrooms, standing in the hallway during passing periods and avoiding distractors when I need to be present (phone, email, etc.). Be present in my home. Put down, put away, put up my phone and laptop to avoid working being seen as a priority over my wife or sons. Play. Listen. Enjoy this time. Best of luck in selecting your ONE WORD for 2019. As we finish the 2018 year this week at South, I want to wish you and your family a relaxing, joy-filled winter break and a happy New Years. All of us here at South MS look forward to a fantastic second half to our school year beginning January 2nd! Report to the gym and wait for instructions from Mr. Young. You cannot leave before 4:45 pm without an adult coming in to check you out. We expect all students to stay until 4:45 pm unless a specific need exist. Pick up your child at South MS by 4:45 pm. All students will exit at 4:45 pm so you do not need to come inside. We will not have supervision after the party is over so it is important you pick up on time. We will not have anyone answering phones during the party or following. If a student does not have a phone and needs to use one, they may find an adult and use the office phone. Below is a map for pick-up time. 7th grade students will meet parents out back (NE parking lot). We will follow similar pick up procedures than we do out front (i.e. one pick up line OR park in parking lot & student walks to you). Students walking home will need to wait until 4:45p as no student may leave without an adult present. You will need to walk in to through the main doors and check-out your child in the office (and any children riding with you) with an adult. If you and your family are attending our South MS Tailgate Party this evening at 5:30p, we are moving it to the South MS Commons because of the rainy day and cool weather. 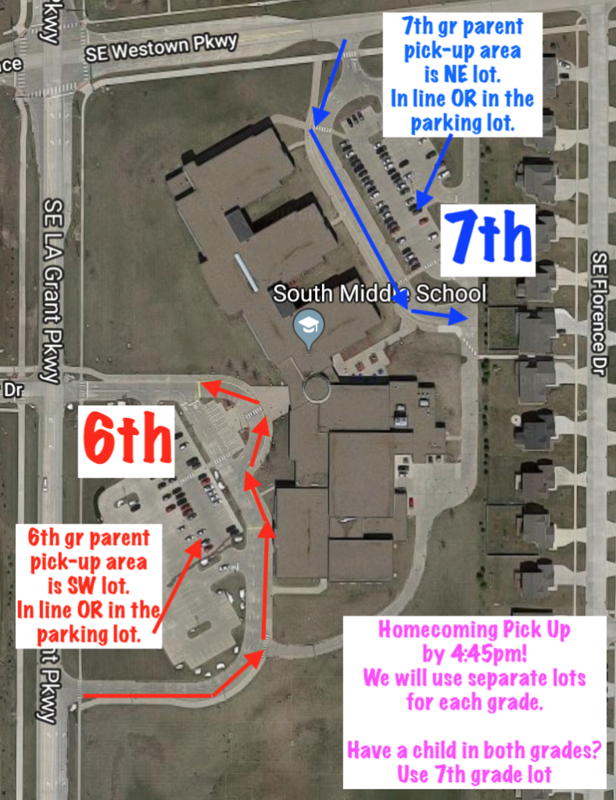 We are adjusting our time to 5:00-6:30pm to allow families picking up students from the Homecoming Party to stay and eat and time for families to get to the stadium for the 7:00pm kick-off. For families who like the cool weather, we will utilize our outside commons area as well so feel free to bring a lawn game to play and lawn chairs. If you did not pay online, we are collecting money at the event; $10 per family. We’re expecting a big crowd and can’t wait to connect with our staff, students and their families attending. Feel free to bring your favorite finger food (we won’t have silverware) to share. If the weather doesn’t cooperate, we’ll hold the tailgate at South MS in the commons. We’ll let everyone know our plan by noon on Friday. 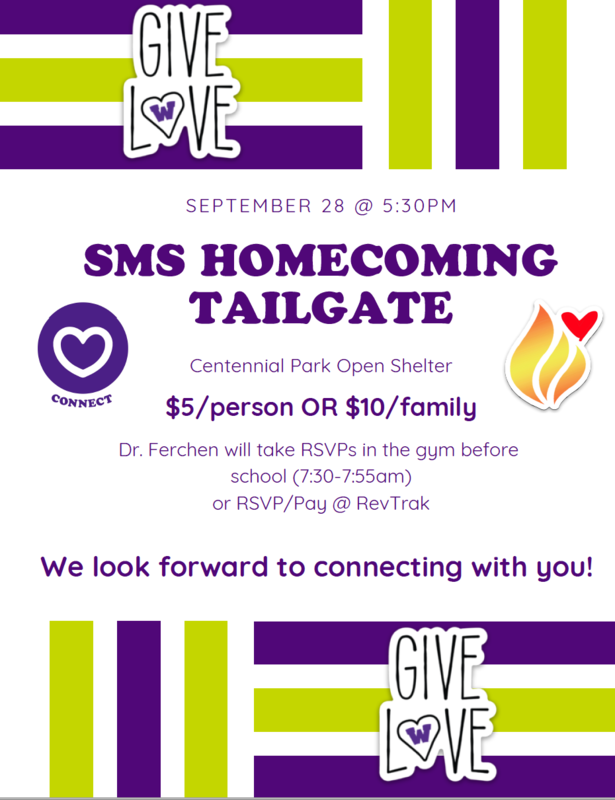 We are very excited to host our first ever South MS Family Tailgate on Friday, September 28th at Centennial Park in Waukee. All South MS families and staff members are welcome to join us for some food, fellowship and fun! Bring your favorite family tailgate side dish or dessert if you’d like or just show up and enjoy. Click here to pay online. Building CONNECTions one activity at a time! One of our goals beginning a couple years ago was to look for additional ways to CONNECT our students to activities, staff members and our school community. From that goal, we formed a Student Connection committee who has tried to be creative as to how we can accomplish this before, during and after school. One idea that came out of this group was having Interest Groups during Advisory time. Each year, students generate ideas of activities they would enjoy ranging from coloring to card games to tumbling to cricket and many more ideas. Once those 30-40 ideas are generated, a teacher volunteers to lead one of the groups of students, students get to choose their top 3 choices, groups are formed and they meet together in small groups each Thursday during Advisory for 8-10 weeks. Voila! Students meet new friends and make a connection with another adult in the building. Last year, we worked on adding to our before and after school options. Although small in number of opportunities last year, the groups like Art Club, Video Game Club, Basketball and Chess connected some passionate students with passionate adults. This fall, we have some great options for students already and parents/students can find them on this blog. We want to expand our offerings by getting more parents, grandparents and community members involved. 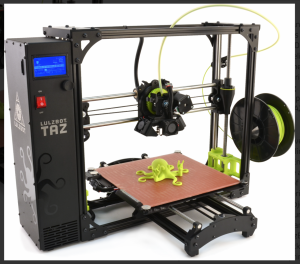 Do you have an idea for a before or after school club, group or activity? You, a grandparent or friend could host a card game club, athletic activities, financial literacy, gardening (we have a garden at South!! ), book clubs, etc here at South before or after school. We’d love to keep adding to our offerings at South MS and you can help! Email me or give me a call to share you idea and begin the planning! 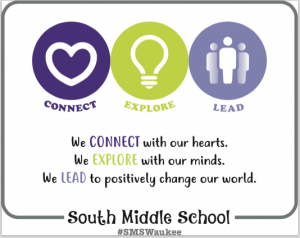 Thank you for helping us continue to move toward our purpose and goal of connecting every child to South Middle School in some way at some time of their day. If you get an error message on August 13 when logging in to PowerSchool, you have not completed one or both of the steps above (please note it takes 24-48 business hours from completing registration to accessing your child’s schedule online). Enjoy the rest of your summer and we look forward to students coming back to school beginning August 23rd!